In a large pot, heat oil over medium heat. Add onion and garlic and saute until translucent, about 5 minutes. Add the cinnamon, nutmeg, sweet potatoes, walnuts and broth. Bring all ingredients to a boil then reduce the heat and simmer until the sweet potatoes can be easily pierced with a fork, about 30 to 35 minutes. Using an immersion blender puree mixture until smooth. Or puree in batches using a blender. Season to taste with salt and pepper. 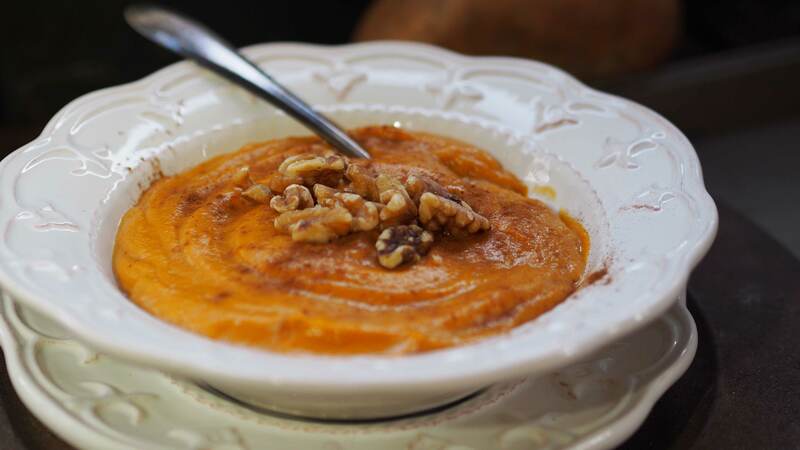 Garnish with walnuts and cinnamon powder and serve.